When I first heard about Revolving Dansk in 2013, I was immediately intrigued. Revolving Dansk’s mission is clear: to bring Copenhagen street food to New York City, and they definitely deliver on that. I attended their event in Carroll Gardens (Brooklyn) at Dassara in 2013, where they shared Danish street food including Danish frikadeller (meatballs) and of course the Danish hot dog, or Danish pølse! 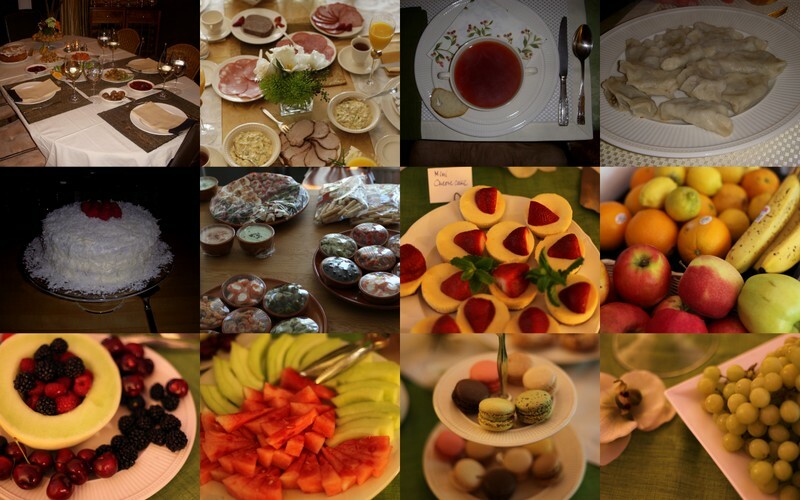 I got hooked then, and have been following the Revolving Dansk adventure ever since, as they’ve been cooking up larger events, pairing with celebrity chefs, hosting private events, and producing their own pølser! According to Revolving Dansk in describing the Copenhagen Street Dog, “Røde Pølser are the traditional pølser of Denmark, which are bright red in color and have a peppery, smoked flavor. Røde Pølser are best prepared lightly boiled with garlic and bacon to keep them juicy and flavorful.” And they add on the site, “Grillpølser are the brown sausages popular at the pølsevogn, with a savory taste and crispy casing. They are best prepared grilled, to lock in the flavor and add to that natural snap.” If you’d like to try some pølser for yourself, you can conveniently shop for them via Revolving Dansk! Most recently the Revolving Dansk duo of Danish-born Martin Høedholt and Sera Høedholt hosted the Winter Hot Dog Championship. 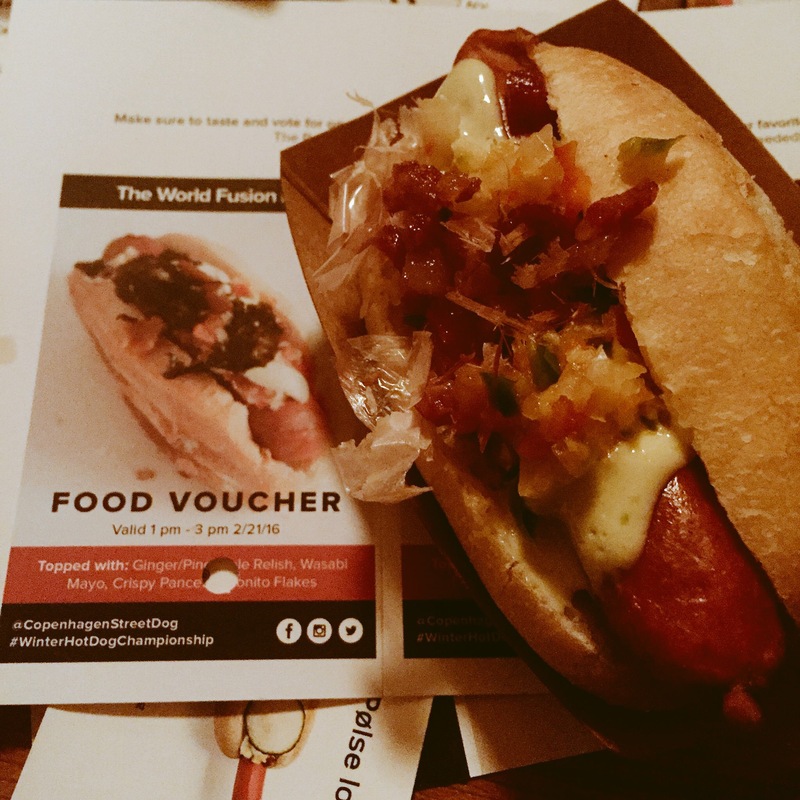 This championship let people submit their own gourmet creations (fun toppings) of the Copenhagen Street Dog. Basically this meant people could submit creations and attendees would vote on three select creations by sampling them at Jimmy’s No. 43. At the end of event, the final vote was cast for the ultimate Danish hot dog! When we got to Jimmy’s No. 43 around 1 pm, the place was already packed with a fun crowd ready to try the three finalists: the Dominican Dane, The World Fusion Dog and the “She’s Gone Nuts” hot dog. All were very creative in their own ways and definitely bursting with flavor, but my personal favorite was the Dominican Dane! The Dominican Dane had just the right toppings and flavor! Even better that these were on top of the Danish pølser! This particular hot dog came with Longaniza, fried plantains, Danish pickles, and spicy mayo. I personally loved this one the best as the flavors came together really nicely. Next up, we tried the “World Fusion Dog” which was also very creative in its mixture of toppings. This one came with a ginger-pineapple relish, wasabi mayo, crispy pancetta and bonito flakes. Never thought to try a hot dog with a somewhat fishy flavor, so definitely an interesting combination! The final selection was the “She’s Gone Nuts” pølser which was really fun, too! Again, I was surprised by the combination of ingredients, and wouldn’t think to try crushed peanuts on a hot dog…but it was really interesting experience. The “She’s Gone Nuts” pølser had honey-sriracha mayo, crushed peanuts, pickled red cabbage and cilantro. And, to end the pølser tasting, it was time for a Danish sweet treat, which reminded me of The Netherlands. The Floedeboller is a light, creamy treat coated in chocolate with a wafer on the bottom. I love how it transported me to my childhood in The Netherlands. If you’re interested in exploring Danish culture, or want to learn more about upcoming events, be sure to check in with Revolving Dansk! Sera and Martin are both wonderful hosts and can teach a lot about Danish culture, and it’s clear that they have a passion behind the mission of Revolving Dansk! You can also follow them and stay in touch via Facebook, Twitter, Instagram, YouTube and Tumblr! Ever been to Denmark? What did you enjoy about the visit? Interested in going? Leave a comment and share your impressions! And, if you like culturetrav.co, be sure to subscribe to the newsletter for interesting updates from bloggers and travelers all over the world who share their stories about culture and travel.